Hardy through mild frosts. In colder areas, small plants can be potted up in fall and grown through winter indoors. Tomato, Broccoli, Cabbage, Kohlrabi, Cauliflower, Carrot, Rosemary and Lavender. Start with a purchased plant, or start seeds indoors in later winter to early spring. Plants started from seed may not bloom their first year. One-year-old plants nursed through winter produce beautiful blue flowers. 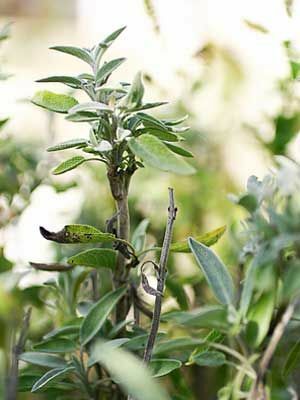 Sage grown in containers can be kept in a cold garage through winter. Gather sprigs as needed in the kitchen. Gather stems for drying from spring to autumn.